(Bass), and polymorphic instrumentalist Robby Moncrieff, of The Advantage and Marnie Stern. The trio, scheduled for their Korean debut this April by way of SUPERC۞L۞RSUPER Concerts, are most noted for their abstract melodic compositions on complex progressive, art/math rock constructions; producing some of the most playful harmonies atop an intricate, densely arhythmic and highly original musical script. The do-or-die energetic performances gained them a spot on Obey Your Brain Records early last year alongside Man Man and Beirut, and earned them full tours with indie greats The Dirty Projectors, and Deerhoof as well as shows with Mono, Tune-yards and Animal Collective. In their superbly-crafted debut album Content Imagination (Obey Your Brain)– recorded above an underground Sacramento art house, the release’s colorful sonic score stands alone; a work written in a foreign musical language not yet caught on by the mainstream. What’s Up?’s execution, stylistically hectic and decidedly lo-fi, sounds altogether precise and robotic while maintaining a unique aesthetic blend of beautifully-distorted synths, tight drum rhythms and odd, but incredibly melodic passages. The EP, approximately thirty minutes long, is at every moment dense with tightly-woven intricacies and refreshing to even the most discriminating audio palette. It remains debatable that the only thing more impressive than the craftmanship behind Content Imagination is the energy and chemistry behind the band’s live performances. Also joining to support an ambitious beat-based record Combed Over Chrome EP (Obstructive Vibrations) is Raleigh Moncrief; an artist that grows more expansive and ambiguous with each successive track. The tracks are a trans-genred collage of experimental noise-ghetto beats and glitchstep. All tracks feature heavy bass beats and glittering synth arpeggios and samples from the Dirty Projectors, who Raleigh recorded Bitte Orca for. 매쓰팝의 천재들로 주목받고 있는 What’s Up? (Sacramento에서 결성되어 Portland에서 활동중인)은 Teddy Briggs (Drums/Keyboards ), Brian Pasos (Bass) 그리고, 그룹 The Advantage 뿐만 아니라 Marnie Stern에서도 활동했던 다양한 경력의 소유자 Robby Moncrieff로 구성되어 있다. 추상적이고 복잡하지만 진보적인 매쓰록 구성과, 파워풀하고 흥겨운 그들만의 세련됨과, 독창성으로 주목 받고 있는 이 트리오가 SUPERC۞L۞RSUPER의 기획으로, 한국에 첫 발을 내딛는다. 죽기아니면 까무러치기 격으로 에너제틱한 그들의 퍼포먼스로 Man Man이나 Beirut가 소속되어 있는 Obey Your Brain레코드사의 스포트라이트를 받아, 인디씬의 명사가 되어버린 Dirty Projectors, Deerhoof와 긴 투어를 함께 했고, 뿐만 아니라 Mono, Tune-yards, Animal Collective 와도 함께 공연했다. 사크라멘토의 한 아트하우스에서 녹음된, 그들의 빼어난 데뷔 앨범 Content Imagination (Obey Your Brain)은 아직 메인스트림에서는 따라가지 못할 독창적인 그들만의 다채로운 음악언어로 우뚝서있다. 이러한 독특하고 아름답지만 뒤틀린 전자음과, 박진감 넘치는 기묘한 드럼라인, 형용할 수 없는 멜로디 라인이 펼쳐지는 동안, 스타일리쉬한 긴장감과 로우파이 사운드가 한데 녹아들어 What’s Up?의 솜씨를 유감없이 드러내준다. EP는 매 순간 타이트한 정교함과 신선함, 차별적인 음향 색감으로 30분 가량의 러닝타임동안 채워져있다. 라이브 퍼포먼스에서 Content Imagination의 솜씨보다 더욱인상적인 것이 에너지와 어떠한 화학적 끌림이라는 것은 눈여겨볼만한 사실이다. 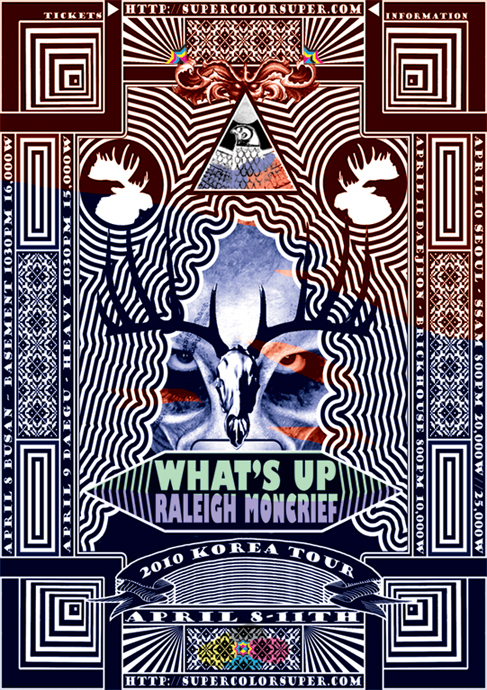 또한 이번 콘서트에서 협력자로 나선 일렉트로닉 비트로 무장한 Combed Over Chrome EP (Obstructive Vibrations)의 Raleigh Moncrief는 그의 성공적인 트랙들과 함께 계속해서 전도유망해지고 규정되지않은 음악스타일로 주목받고 있다. 그의 트랙넘버 들은 익스페리먼탈 노이즈와, 게토비트, 글리치스텝의 장르를 넘나든다. 모든 트랙들은 무게감있는 베이스비트와 빛나는 신스아르페지오, 그가 Bitte Orca의 녹음 작업에 참여 했던 Dirty Projectors이 두드러진다.